Are you struggling to find a new target market? What if you can find out how many people in a specific target market actually pulled out their credit card or dialed up their Paypal account and spent money to buy a product, how many people did it, and even how many people did it in the last 30 to 90 days? This is a whole different ballgame than looking at the number of searches on a keyword in Google. Searches don’t mean anything because they don’t tell you if people will spend money or not. Because if there’s one thing that STOPS people dead in their tracks from getting their own products, so they can trade products for dollars instead of time, it must be finding a target market and 12 irresistible product ideas. If You Could Spend 90 Days With Marlon, Listening, Watching, and Absorbing Everything He Does For 8 Hours A Day, Then Detailed All The Secrets In A Diary, What Value Would You Place On It? Marlon said that for 90 days he would train me (then 19 years old) in all the different facets of business and marketing. And train me he did! Copywriting… lead generation… selling… even the psychology behind it all. Marlon left no stone left unturned. 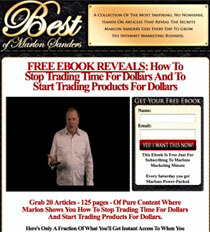 Imagine your ebook, cd, book or info product featured on the top 12 most trafficked web site in the entire world. I’m talking 47 million visitors a MONTH! Just imagine, every day they get 1.56 million visitors (more or less)! That’s a stunning 47 million visitors per month And you can get FEATURED on their site! Now, there’s quite a fascinating story on how you can get on there NOW! She’s called The Queen of Free Traffic. And her story is one I’ll never forget…and I dare say after you’ve read this, you won’t either. Out of 582,000,000 pages indexed by Yahoo for the term FREE TRAFFIC she would be #2. And has been for years. Out of 18,700,000 pages listed by Google, she’s STILL #7 for the most competitive keyword you can imagine. And this is through every algorithm change imaginable. This is why I call it “evergreen.” What’s more, she is STILL ranked on page 1, 2 or 3 for 1,400 major and minor keywords. And has maintained those rankings through the thick and thin of Google updates. The result? 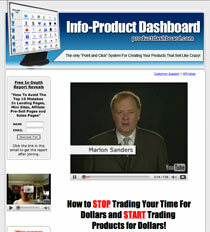 21,000 visitors in 30 days for FREE! And that’s why they call her the Queen of Free Traffic. That’s exactly what I’ve done. And what I’m going to do right now is PROVE it to you with actual screen captures from Web Trends Live, which is one of the leading statistic tracking programs on the net. But not only will I prove it to you, I’m also going to show and tell you exactly, specifically how I got 1 out of every 102 English speaking ‘Net users in the world to visit my web sites.